Foot Squad is NYCPRC's fledgling volunteer outreach that grabs thread / string / hair injured birds in the street and tries to fix them on the spot and release them, though more often than not they need a visit to a vet and a few days to weeks aftercare to ward off infections and bleeding.. Try to accompany that with photos if you can. 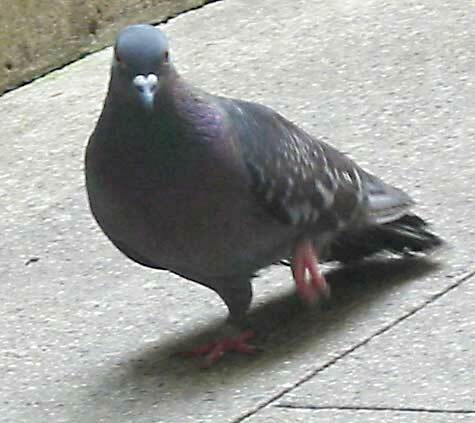 This Pigeon was found suffering at Columbia University..
AKA "Pillow Foot" get's it's leg fixed at CUNYC in a solo operation by Jennifer..
Not threaded but foot problems. Rambo would've lost 2 toes - One saved. It's amazing what a strand of hair can do. One of the worst cases ever. An unbelievable amount of junk was attatched to Bag Bird. More hair? Much more hair. Be experienced in handling birds. That's it - you're a member! *The "fixing" should be done by a veterinarian wherever possible - as even simple looking thread problems can escalate to fatal bleeding or infection. Foot Squad members have access to experts to advise. Send in close up large photos before you attempt to catch and you can recieve advice too. Our experts have seen many feet. Sorry - we are unable to disclose Foot Squad's vet - we advise you to seek and cajole vets to assist. Most will charge a hefty fee. A precious few will not. Good luck to you and the birds you try to help. 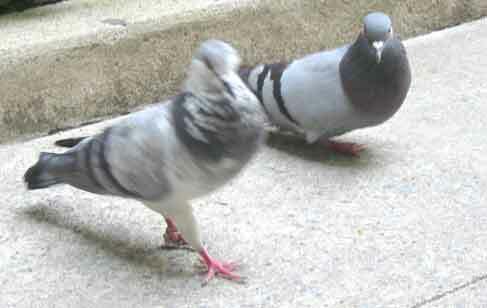 This Pigeon Vice is to aid the Foot Squad operative in the street. The device restrains and calms a bird with velcro straps above the chest and below the legs, and a hood that covers the head. The bird is strapped upside down. The bird, in the restraint, is then strapped to the operatives upper thigh while in a sitting position, so that the bird's feet are over the operatives knee. Slip the tools into the slots on the backing material for easy reach while working. When the design is finished and a proto type tested, production of a few can begin. Estmated cost each $40. These scissors range from $3.99 to $100. Rats Tooth Tweezer has a tiny "Tooth" in each side at the point. An amazing picker. You can't see the tiny interlocking teeth in this picture.